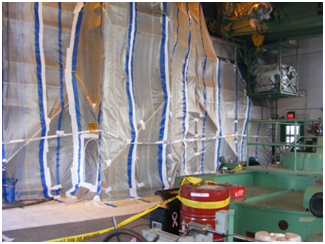 To meet the requirements of the specifications, IMS developed a Quality Control Program, Hazardous Waste Program, Environmental Protection Control Program prior to starting the Lead Paint Abatement, Repair and Coating Installation. The tail race and head race gates were disassembled, removing all gate fill valves, seals, wheels, shafts and bushings. All valves were sent out for rebuild by a qualified shop, all wheels, shafts, bushings, and spacers were inspected for wear and serviceability. 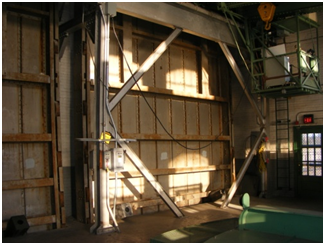 Meanwhile all gates were sandblasted in sealed chambers to white steel. A 3 part high zinc vinyl primer was applied to the gates and components followed by a durable vinyl coating. 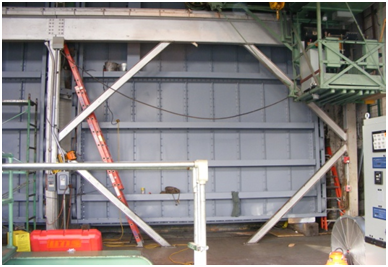 The gates were reassembled back to original construction specifications by trained millwrights. New direct replacement seals were provided and installed on the main power house gates by IMS staff. An old style gate seal on Unit 10 was replaced with a new J-bulb seal, and modifications to the gate to accept the new seal were designed by the IMS staff engineer. 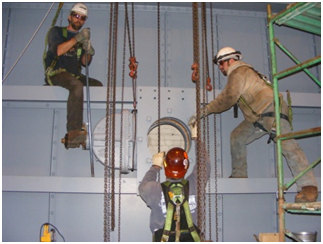 All work was managed for quality and safety using IMS CQCM trained supervisors on-site utilizing the USACE 3 Phase Inspection Process. The project was completed 10 months ahead of the 12 month schedule.